Dominios Chile Review 2019: Is Dominios Chile a Good Hosting? Dominios Chile (Dch) is a Chilean hosting provider that has been in business since 1999. You won’t find endless features and the higher-tier plans are pricey, however, the lower-tier plans come with some generous resources for a good price. Dch has been providing Chilean-based hosting since 1999. It has its servers colocated in a Tier III data center in Santiago, Chile, and the website is only available in Spanish. 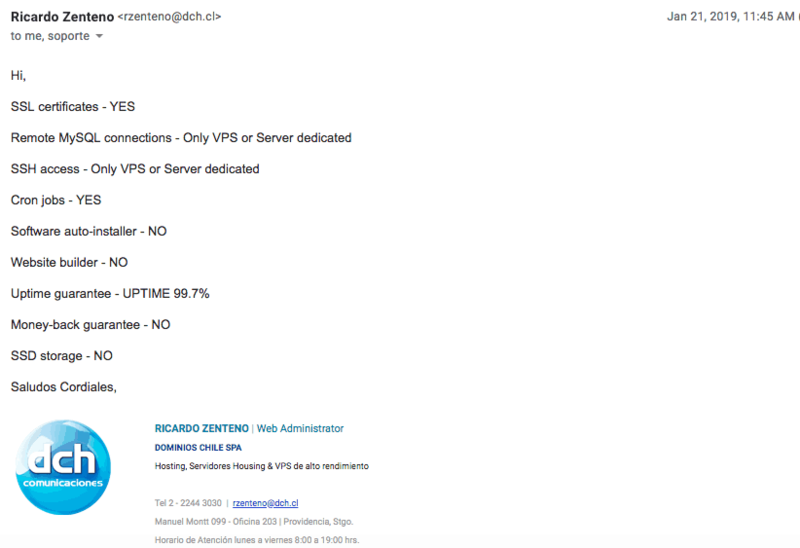 Dch co-locates its servers in one Gtd Group’s data centers in the Santiago,Chile. While its not owned and operated by Dch, which is always preferable, you can take comfort in the fact it’s certified Tier III by the Uptime institute, meaning less than 1.6 hours of downtime per year. Oddly, it doesn’t use SSD storage, and still relies on the far slower HDD. There’s no uptime guarantee on the website, though Dch advertises a 100% uptime in the last 12 months and an uptime of 99.99% availability for its infrastructure. I checked in with support, and they confirmed that 99.7% uptime is guaranteed (which is lower than the industry standard, 99.9%). In terms of shared hosting plans, there are eight Linux plans, which support PHP, CGI, MySQL, and phpMyAdmin, and five ASP plans, which support ASP, ASP.NET (v4.5), and Microsoft SQL. The rest of the inclusions are quite similar. All plans come with cPanel (an easy to use and trusted control panel), FTP access, and some fairly standard security measures e.g., AntiVirus and Firewall. There is no website building tool or one-click installer (I checked with support), though SSL certificates and Cron jobs are supported, even though neither are advertised on the website. If you need remote MySQL connections or SSH access, you need the VPS or dedicated server plans. The prices start quite affordably and in line with local and international competitors, however, the higher-tier packages are pricey. At odds, the features remain the same throughout the plans, with only the resource allocations increasing with the price. If 1 GB disk space and 10GB monthly transfer is enough for your website, you can choose the lowest package, get a great price, and benefit from all of the same features in the top-tier plans (albeit in smaller levels). Dch registers domains (only .cl extension), however, it’s an added extra cost, and after checking with support, I can confirm that SSL certificates are provided. Unlike lots of similar companies, Dch does not overwhelm you with add-ons in the checkout flow. Unfortunately, the link to the contact page was giving me a 403 error, but luckily, the company’s phone and email address is clearly advertised on the website, so I could contact the team that way. There’s also live chat, although it was offline when I visited the site (it was before its usual business hours in the morning). General support is available from 9:00 a.m. to 7:00 p.m. and in the event of an emergency, you can contact the team 24/7. I’ve contacted them via the offline live chat window and received a response answering my question in full (and in English) within a few hours. Dch provides a comprehensive selection of hosting plans including specialist WordPress, Joomla!, VPS, and reseller plans. The overpriced higher-tier plans (unless you need a high resource allocation) don’t add much value in terms of features,but the lower-tier plans include the same features, at a decent price point. 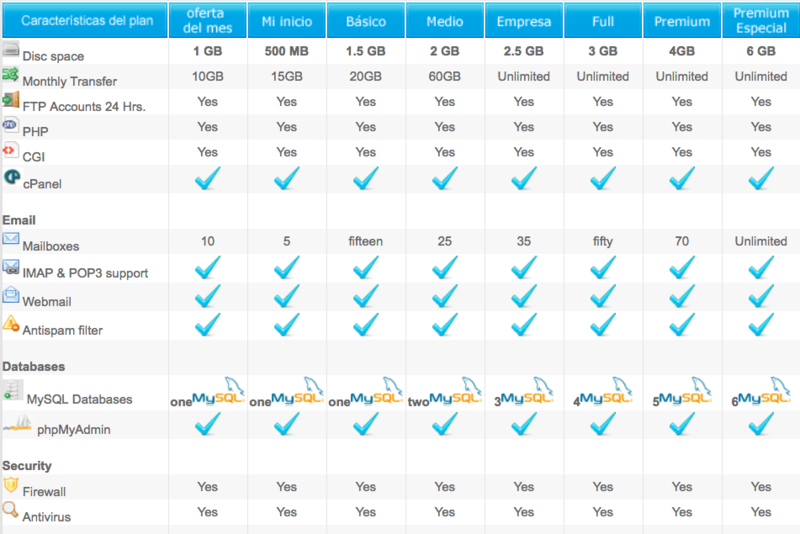 Wondering how Dominios Chile stacks up against other Web Hosting companies? Enter any other Web Hosting company and we will give you a side-by-side comparison.